Show the story through the flow map already drawn on the chart paper. Ask students to predict what they think will happen to the snowman next. Each student will get a blue piece of construction paper and paint what they think the snowman will look like after spending the day in the sun playing with his/her friends. While their paint is drying, they will cut out the various accessories and parts from construction paper. Then they will glue the accessories and/or parts onto their painted snowman. 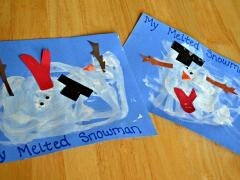 Write their name on the finished painting and title it "My Melted Snowman". Take a picture and email to andersons@lisd.net. Place them to dry on the designated table for your class.